As we march into the teeth of the winter holiday season, it seems only appropriate that we should turn our attention to Log Haven restaurant. It's the perfect setting for a holiday dinner or celebration—if you can score a table this time of year, that is. The restaurant is decked out with fresh evergreen, Christmas lights, wreaths, a beautifully decorated tree, carolers and live jazz piano in the evening; you can probably count on hearing the Charlie Brown Christmas theme while you sup. It's a magical time of year to enjoy a magical Utah landmark. Of course, I may be biased. My wife is Faith Scheffler, and she coordinates weddings and other special events at Log Haven. That's why you haven't seen a review of the restaurant from me since we met and married. 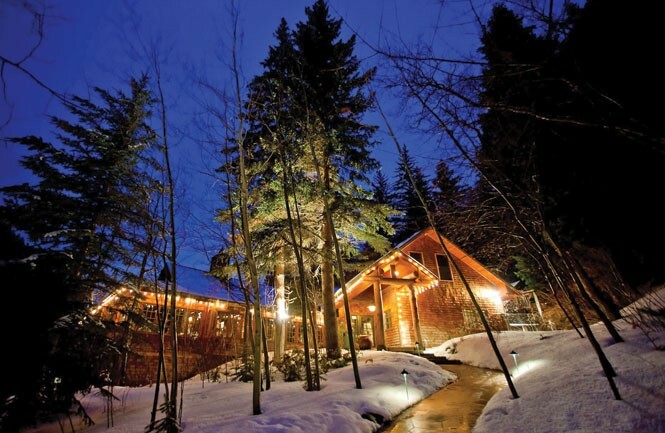 Still, it's an important Utah institution, and it is newsworthy and noteworthy when any restaurant celebrates a 20th anniversary, as Log Haven did this November. If you haven't heard the Log Haven story, the script is one suitable for Hollywood—full of intrigue, romance, murder, ghosts (yes, ghosts! ), passion, failure, rebirth and more. Here is the brief Cliff Notes account: The building itself, a log mansion, was built in 1920 as an anniversary gift from steel magnate L.F. Rains to his wife. In 1958, the mansion was converted into a restaurant that became a much sought-after venue for weddings and famous for its Sunday Hunt Brunch. However, in the early '90s, the restaurant fell into disrepair and was slated for demolition. Oh, and did I mention the double murder that took place in the (then)-Log Haven driveway? That may or may not have anything to do with the ghosts many people have reported encountering at Log Haven through the years. Log Haven owner Margo Provost spent the earliest part of her life in an orphanage, but her path ultimately led her to Millcreek Canyon and the nurturing space that is Log Haven. The road wasn't easy, however. "When I purchased Log Haven, I really wasn't buying a restaurant ... I was imagining a different life," Provost says. She had risen through the ranks of corporate America, but was unsatisfied. So, she and her then-husband secured loans to buy, gut and refurbish the restaurant, as well as max out her credit cards and liquidate assets, including her retirement savings. She was financially out on a Log Haven limb. "There are easier paths you can travel than opening a restaurant," longtime friend Deedee Corradini counseled Provost in 1994, adding, "You are crazy!" Obviously, things have turned out pretty well, despite some early struggles. Provost credits much of her restaurant's success to the core team she's assembled around her. Chef Dave Jones has been in the kitchen pretty much from the start, with just a brief hiatus a few years back when "I just got burned out cooking," he says. General manager Ian Campbell has run the front of the house for 18 years, and Faith Scheffler has been booking and running weddings—some 150 or 200 per year—for 17 years. Add to that a number of long-tenured servers, and you've got a recipe for stability and consistency. Even with the glorious surroundings and ambiance Log Haven offers—cascading waterfalls, mountain views, lush greenery, a fish-stocked pond—people come primarily for the food. Jones says that while Log Haven might never be known for cutting-edge cuisine, he prides himself in the "diversity" it offers. One of the most difficult aspects of cooking at Log Haven is having to meet the needs of large wedding parties and special events—which usually means big buffets—alongside an upscale à la carte menu for individual diners. "It's a hard thing to balance," Jones says. In perusing menus and reviews written back in 1994-95, I'm struck by how timeless Jones' cooking seems to be. Somehow, while growing and evolving in the kitchen, he's eschewed most of the trends and fads that so quickly come and go. Dishes from 1995—like smoked duck breast with barley risotto, apples and wilted frisée or coriander-rubbed Hawaiian sashimi-style tuna with lemon-guava sauce and soy-ginger glaze—would be as at home on today's Log Haven menu as they were back then. Those dishes don't seem so different in spirit from the current menu's seared scallops with brown butter, hazelnut risotto, mascarpone and mushroom consommé, although Jones says that through the years he's "simplified" his cooking, leaning toward less complicated dishes. When I asked Jones to comment on the Utah dining scene over the past 20 years, he served up that iconic Dave Jones laugh that's so well known to his friends and colleagues, and says, "Yeah, I've seen it go from zero to 60 in 20 years!" Back then, he couldn't even find something like mesclun greens here. Provost tends to speak of Log Haven in spiritual terms. "Nature, nurture, nourish" is her mantra and, although she owns the restaurant, she considers herself as "a steward of this island" that is Log Haven. She has lived on the Log Haven property for 20 years—first in a motorhome during demolition and construction, and then in a small house located on "The Meadow" across the street from Log Haven, where weddings take place regularly on her front lawn. You probably haven't read about Log Haven's 20th anniversary elsewhere, because there were no press releases announcing the occasion, no special "throwback menus" or celebrations. That's likely because Provost simply didn't want to toot her own horn. Or, maybe she's just too busy feeding bellies and souls to take time out for self-serving congratulations. So, I'll do it for her: Congratulations to Log Haven and its staff on reaching a real milestone—20 years of nature, nurture and nourishment.